(Phys.org)—Like a ship plowing through still waters, the giant star Zeta Ophiuchi is speeding through space, making waves in the dust ahead. NASA's Spitzer Space Telescope has captured a dramatic, infrared portrait of these glowing waves, also known as a bow shock. Astronomers theorize that this star was once sitting pretty next to a companion star even heftier than itself. But when that star died in a fiery explosion, Zeta Ophiuchi was kicked away and sent flying. 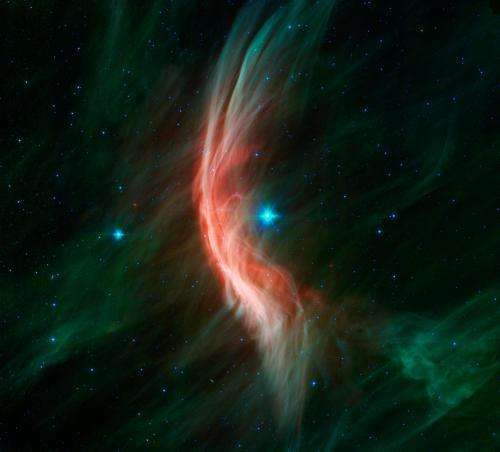 Zeta Ophiuchi, which is 20 times more massive and 80,000 times brighter than our sun, is racing along at about 54,000 mph (24 kilometers per second). NASA's Wide-field Infrared Survey Explorer, or WISE, released a similar picture of the same object in 2011. WISE sees infrared light as does Spitzer, but WISE was an all-sky survey designed to take snapshots of the entire sky. Spitzer, by contrast, observes less of the sky, but in more detail. The WISE image can be seen at: phys.org/news/2011-01-runaway- … tar-plows-space.html . More information: For more information about Spitzer, visit spitzer.caltech.edu and www.nasa.gov/spitzer.